Maneuvering Your Career is a success blueprint for today’s working professionals. With virtually no guarantee of a long-tenured career, the office can be a scary place. We want to live our lives and go after our dreams, but too often, we work in a dysfunctional environment, for a crazy boss, and we feel trapped. 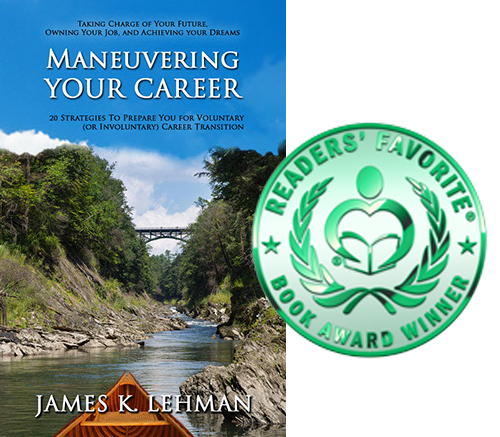 James Lehman, after working more than twenty jobs in thirty years, knows how to maintain sanity and gain the freedom and respect an employee deserves. Let him teach you how to have the career you want, despite the economy, industry changes, takeovers and mergers, and without waiting for your crazy boss to get fired or retire. Enjoy your work and leave it at the office so you can enjoy your life. Having the freedom to do what you want, for who you want, when you want is powerful. It’s never too late to take charge of your career and maneuver it into being the rewarding experience you deserve. What if there were a set of strategies that you could follow so you could always be prepared, not just for those times that fit your company or your boss, but for those times when you are ready to make a change? On your schedule, as part of your plan. In this book, James has created a list of 20 such strategies to put you in charge. To take control of your job, and to help you achieve your dreams. No more living in fear, or being stuck, or being a victim in your life because of the whims of your idiot boss. Click Below to Buy Your Digital Copy Today!